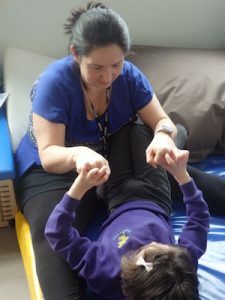 Children with complex health issues often have very negative experiences of touch, explains Barbara Moore, a Massage and Story Massage Instructor who believes passionately in sharing the pleasure and benefits of positive, nurturing touch. Barbara, pictured below, right, has recently won our Story Massage Best Practice Award for her work with children with sensory impairments and life-limiting conditions. We met your friends (The Half-Circle) Add names. During our Story Massage training days, we invite everyone to work together to adapt or create a massage story. As you can see from the video below, Barbara had a creative time working alongside Rosemary Barrett to write a massage story to welcome children and families into the new environment of a children’s hospice. 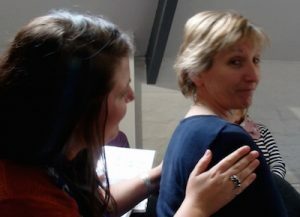 Story Massage combines the benefits of positive, respectful touch with the creativity and engagement of storytelling. Ten simple massage strokes form the basis of the Story Massage programme. These strokes have a child friendly name, such as The Circle or The Sprinkle, and an easy to recognise symbol making it accessible for all. It is a fully inclusive activity, no clothing is removed and no oil is used. Stories can be taken from our Story Massage book, adapted from favourite stories or songs. 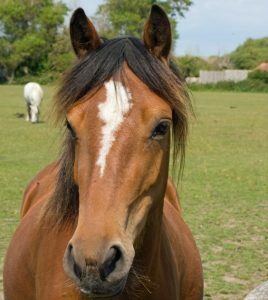 or you can even create your own stories like Pony Club. Are you inspired by the way that Barbara is using nurturing touch for children with sensory impairments and life-limiting conditions? 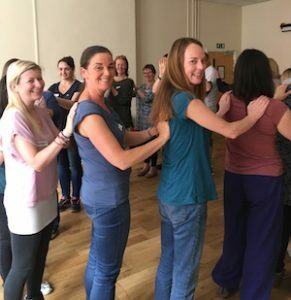 Would you like to train to use Story Massage in your work or home? We run a one day accredited training courses held around the country for individuals and groups. These days can also be organised as in-house training sessions. And we have a new online training option.